My car may not be a prime racing machine, but its performance is just as important to me as it is to a NASCAR race car driver. I need my car to be running efficiently and safely every time I start the engine. Can the “Honest-1 pit crew” give me some tips? If you want your car to have maximum performance, longevity, and save on gas, you have to pay attention to maintenance services and when they are due. In fact, performing maintenance services like flushes and regular oil changes are proven to save money in the long run and prevent costly repairs. But, how do you know when these services should be performed? Each car manual has a suggested maintenance schedule. Use this schedule to help you decide which services your vehicle needs when. Note that driving styles vary and some climates (such as Arizona’s extreme heat) cause cars to operate under what is termed “Severe Driving Conditions”. In order for your car to operate properly, it relies on a variety of different fluids. These fluids lubricate and protect various parts and systems in your car and are integral to proper functioning of your vehicle. Although these fluids last for certain period of time, they do break down or become contaminated with dust and dirt, making them essentially ineffective. In Arizona, our severe heat and the increase of dust and airborne contaminants can increase the frequency of certain maintenance services. Use the maintenance schedule, get a thorough inspection of your car by a trusted professional, and evaluate your driving habits to pinpoint a more accurate maintenance plan for your vehicle. Brake fluid is hydroscopic and absorbs water. At some point, brake fluid absorbs as much water as it can hold. The unabsorbed moisture lowers the boiling point of the fluid causing a loss of brake pressure, the seals to deteriorate, increase corrosion and decrease brake performance. Changing the brake fluid extends the life of the brake system, removes damaging deposits and improves brake performance. Keeping an engine operating at a proper temperature ensures a safely running car. Your cooling system is designed to prevent motor oil from overheating in normal or hot driving conditions or freezing in the winter. Your vehicle's radiator and entire cooling system needs to be clean in order to cool an engine properly. An overheated engine is a costly mistake and in AZ, and one we see all too frequently! 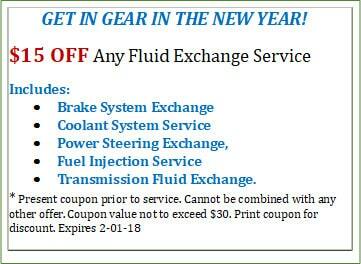 This flush service can help prevent engine failure! Neglected, dirty power steering fluid can possibly compromise the performance of your car and create damage to your steering system. Not flushing contaminated power steering fluid may lead to difficulty steering, a reduction of steering effectiveness, leaks and wear acceleration. A power steering exchange improves performance and car safety, provides proper lubrication, quiets system operation, and prolongs the life of the power steering system. Over time, some cheaper grade gas fuels can cause build-ups of wax, dirt and other impurities which clog fuel injectors, affect air flow and decrease fuel efficiency. Think lower gas mileage and decreased performance! The fuel injection service cleans your system from the tank forward. It removes these deposits and restores optimal engine performance. Transmission fluid lubricates, cleans and cools the automatic transmission ensuring a smooth operation. Heat destroys the lubricating qualities of the fluid and over time causes the transmission to slip, the clutch to burn out, and eventually transmission failure. A fluid exchange prevents expensive transmission repairs and promotes smooth shifting both while extending transmission life and validating compliance with your manufacturer’s recommendations so you don't void your manufacturer's warranty! Start 2018 right by letting our trained professionals at Honest-1 help provide you with an accurate maintenance schedule for your car and your specific driving needs. We service all types of vehicles! Detailing a plan and keeping track of it in our computer system will allow you to rest easy knowing you are doing all you can to help you, your car and your budget. Make an appointment today! Use this coupon for even MORE Fall Savings!